Applications are invited from suitably qualified candidates for admission into Wesley University, Ondo, Joint Universities Preliminary Examinations Board (JUPEB), Pre-Degree and certificate Programmes for the 2018/2019 academic session. This foundation programme is designed to prepare candidates for the examinations conducted by the Joint Universities Preliminary Examinations Board (JUPEB). 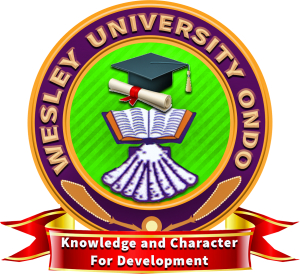 Successful candidates have prospects of admission into any of the Degree Programmes of Wesley University Ondo or any University of their choice. Wesley University JUPEB Entry Requirements & Programmes. Candidates for Foundation Programmes should possess a minimum of five (5) O’Level credits in one or two sittings, in subjects relevant to their choice. Wesley University Pre-Degree Entry Requirements & Programmes. Candidates for Pre-Degree should possess a minimum of five (5) O’Level credits in not more than two sittings, in subjects relevant to their choice. Candidates without complete O’Level results are encouraged to take advantage of the programme to re-take their O’Level examination in order to qualify for University admission. Applications are invited from suitably qualified candidates for sub-degree programmes in the Centre for Entrepreneurship Education. Available programmes include Tourism/Hospitality Management, Science Laboratory Technology, Computer Hardware, Data Processing/Networking, Event Management, Office Management, Mass Communication, Local Government Administration, Public Administration, Intelligence and Security Studies, Poultry Technology, Bee Keeping, Snail Rearing, Goatry, Cassava Processing, Farm Management. How to Apply for Wesley University JUPEB, Pre-Degree And Certificate Programmes. JUPEB and Pre-Degree applicants should pay the sum of ten thousand Naira (N10,000) to Skye Bank Account No. 1770793957. Certificate programme applicants should pay N5,000 to Skye Bank Account No. 1771757411. Application forms can be obtained online or at the University Campus.